This week's featured teacher is Ashley from Teaching in Bronco Country. What is your favourite part about teaching? I love to instill a love of learning in students. I love to see their excitement as they are learning. What is your best advice for a beginning teacher? Ask for help and fake it until you make it. You are an expert and you have ideas to offer. Don't forget that! 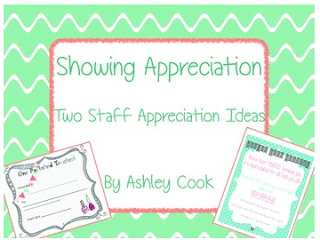 Ashley would like to share a staff appreciation freebie from her TpT Store. You can download the file by clicking on the picture below. If you download this freebie, don't forget to leave Ashley some feedback for her generosity. You can do this by clicking on "My Purchases" and finding the download in your "Free Downloads" tab. Don't forget to check out the Teaching in Bronco Country blog for a peek at Ashley's journey in a technology-centred school. Thanks, Ashley, for participating in this week's Teacher Feature! If you would like to be featured on Primary Teaching Resources, please fill out my Google form. Priority will be given to kindergarten to fifth grade classroom teachers who are following me on social media.